Get a professional introduction to stand-up comedy. Understand how to develop a 5-minute stand-up comedy routine. Sign up for stage time at an open mic. Purchase this webinar and get all these cool things! VIP access to this month’s Stand-up Comedy for Begionners webinars, Part 1 and 2! Tips, advice and coaching from a professional with 25+ years experience. Please click here to purchase the Stand-up Comedy for Beginners webinars for May 2019. Hosted by Chuck Roy, a funny stand-up comedian featured in TV and Movies! 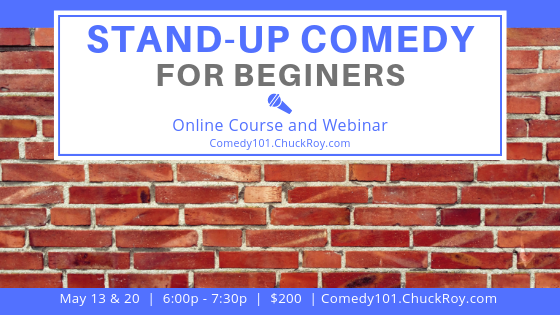 Chuck hosts this webinar to help you develop a funny, original 5-minute stand-up comedy routine. Get tips for creating a set list that gets big laughs. Build your professional comedy show business skills. Who should attend this webinar series? This webinar is designed for professional comedians that want to develop a new, 5-minute set. Amateur comedians in need of a 5-minute set for auditions and showcases. Open mic comedians with a strong desire to create their funniest comedy show. Public speakers that want to create a funny, 5-minute comedy routine. People that want to be funny on stage. Small class size! Access is limited to 5 people! Sign up today! Click here to purchase the Stand-up Comedy for Beginners webinars for May 2019.